Wirebound notebook contains 80 sheets in a one-subject format. 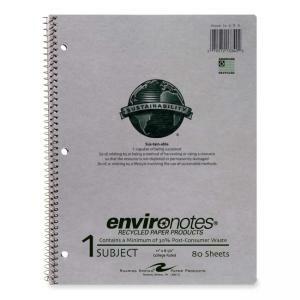 Kraft cover and each sheet are three-hole punched to secure in standard three-ring binders. Each sheet is college-ruled. Paper is made of 30% post-consumer material. Front and back of the cover are made of 100% recycled material with 20% post-consumer content.